Elected officials, affordable housing advocates, and preservationists speak on historic preservation’s impact on New York City’s affordable housing shortage. 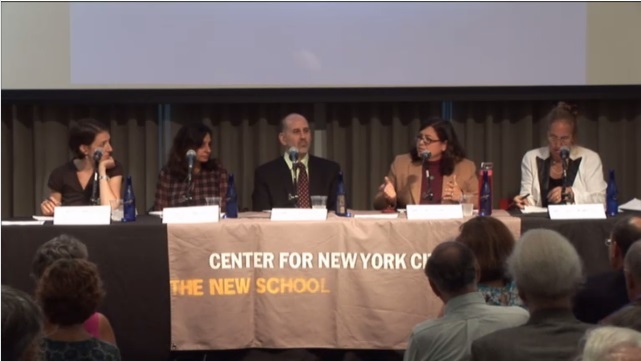 On September 16, 2014, The Milano School of International Affairs, Management, and Urban Policy at The New School hosted a panel discussion on New York City’s affordable housing shortage and historic preservation. The discussion was co-presented by the Historic Districts Council and the Greenwich Village Society for Historic Preservation. The panel featured Manhattan Borough President Gale Brewer, Council Member Rosie Mendez, Harvey Epstein, Director of the Community Development Project at the Urban Justice Center, Nadine Maleh, Director of the Inspiring Places program at Community Solutions, and Rachel Meltzer, Assistant Professor of Urban Policy at The New School. The discussion was moderated by Andrew Berman, Executive Director of the Greenwich Village Society for Historic Preservation. The panelists then spoke on the affordable housing shortage. Council Member Mendez criticized the 421-A tax abatement for building high-cost housing in the city, saying the abatement was created by former Mayor Ed Koch to keep people from leaving the city. “That was in the 1970s. Why in 2006 do I have to vote to give tax abatements to individuals who are building luxury housing?” Council Member Mendez also addressed weakened rent regulation, claiming her district lost thousands of rent-regulated apartments. She contended weakened regulations were the fault of the Republican-controlled New York State Senate. Borough President Brewer spoke against the ban on new single-room occupancy (“SRO”) housing. “I know families who grew up in SRO’s. I know you’re not supposed to, but they did, and they are doing really well.” She went on to question how the micro-unit project proposed under former Mayor Michael Bloomberg is allowed to go forward, labeling it as “a very expensive SRO” and argued in favor of building traditional SRO units. (See previous CityLand coverage here.) She also proposed some existing SROs receive a tax abatement to keep current tenants in place, claiming single-rooms are going for $3,700 in the West Side. Ms. Maleh spoke against demolishing buildings for new affordable housing stock, arguing it is “one hundred percent possible” to build permanently-affordable housing in landmarked buildings. She went on to claim that landmark tax credits helped bridge a gap in financing, and held out projects like the Times Square Hotel as catalysts for improving community quality of life. Professor Meltzer followed up with a Furman Center report that landmarked buildings could barter air rights in exchange for developers committing to provide more affordable housing. Council Member Mendez claimed the Real Estate Board feeds a misconception that landmarking and affordable housing are incompatible, and pointed to Westbeth Artists’ Housing and 505 LaGuardia Place in University Village as disproving the Board. In contrast, Borough President Brewer supported a citywide plan, stating she had already advocated it with Mayor Bill deBlasio. She did admit building taller in Manhattan was a concern her fellow borough presidents largely did not share, given their extra space. Mr. Epstein strongly advocated a citywide plan and that what each community could change were the percentages of affordable housing units and the acceptable area median income. Mr. Epstein argued a citywide plan would preserve neighborhoods long-term, letting residents stay in their homes as the community gentrifies around them. Mr. Epstein also pointed out that any mandatory inclusionary zoning plan ought to be a fifty-fifty split between market-rate and affordable housing as opposed to the current eighty-twenty split.